We offer a range of mini-treks from the start of May to the end of October. Maximise your time in the Pyrenees by catching the night train down and back. 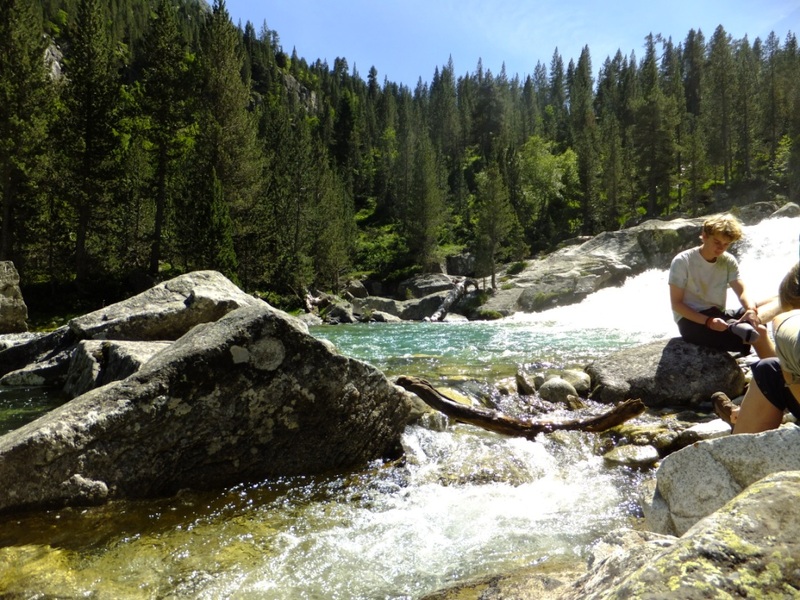 For the Val d’Azun trek at the end of May you will discover the spectacular Pyrenean foothill area around the Pibeste and the Val d’Azun and are based in a charming B&B for the two nights. On the Marcadau trek, the Refuge Wallon is used as a base camp to reach higher ground and we stay here for the two nights allowing a lighter day pack to be carried on the middle day. These mini-treks could be seen as an introduction to trekking, to see if it is something you would like to do for a longer period in the future, or as a short break at the start and end of summer. Price: 395€pp (3 days, 3 nights), Dates: May – Oct.
Our charming hotel in the centre of Argeles is the perfect base for three days excellent walking. We start with the Pibeste Nature Reserve, and the Pibeste Summit, which is really glorious in spring – the south facing slopes are green and full of flowers and Mediterranean plants not usually found in the high central Pyrenees. It is also a site for a huge number of birds all year. The views over the plains and the higher summits are truly spectacular. On our second day we head up the Mont de Gez and into the Val d’Azun, discovering this valley that is often called the ‘Eden of the Pyrenees’. Our last day takes us into the secluded and relatively unvisited Bergons Valley. Price includes three nights half board accommodation, three picnic lunches, three days guided walking. Min 4P. Contact: Sian. Join us for two days walking and one night in a refuge. You walk around the Gavarnie Cirque and then enjoy the wonderful views of the frontier summits and the cirque from the Espugettes Refuge at 2027m where you spend the night. Day two sees us tackle the Piméné summit (2800m) from where you have one of the most spectacular views in all the valley – down to Lourdes and the plain beyond, and south to the Mont Perdu, surrounded by the three glacial cirques (Gavarnie, Estaubé and Troumouse). Descent to Gavarnie at the end of the day and transport back to Luz St Sauveur. Min 4P. Price: 190€pp (1 night all food, 2 days walking), Dates: July – Oct. Grade: moderate-hard, Meet: Luz St Sauveur, Contact: Sian. 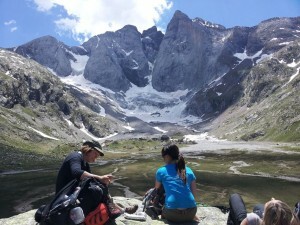 Two days walking to tackle the Vignemale, at 3298m, the highest peak in the French Pyrenees. The first day we head up to the Baysellance Refuge at 2646m which is the highest refuge on either side of the Pyrenees. After the night at Baysellance our second day is a big one, heading up to the summit over the Ossoue Glacier with a qualified UIAGM high mountain guide, and then all the way back down to the Ossoue Dam. Return transport to Luz St Sauveur. Min 4P. 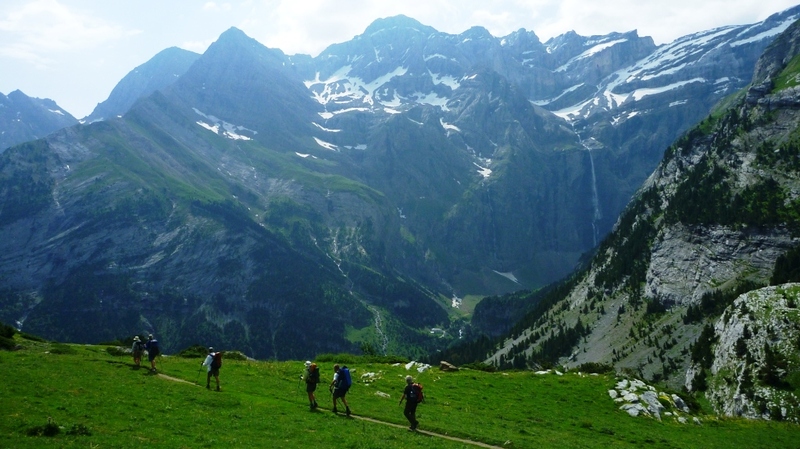 Price: 240€pp (2 days walking, 1 night all food), Dates: July – Oct, Grade:moderate-hard, Meet: Luz St Sauveur, Contact: Sian. Price: 395€pp (3 days, 2 nights), Dates: June-Oct.
After collecting you in Lourdes we head straight up to Pont d’Espagne above Cauterets, leaving the van and climbing to Refuge Wallon in the Marcadau Valley. The refuge sits in the centre of three valleys, giving us three great options: the Aratille lake and pass for a spectacular view into Spain, the opal-coloured lakes of Cambalès or the famous Col de la Fache, where allied pilots escaped Nazi forces during the Second World War and Republican forces fled from Franco in the Spanish Civil War. On our last day we take a circular route via a series of lakes including the magical Lac Pourtet before heading down to meet the path back to the Pont d’Espagne. 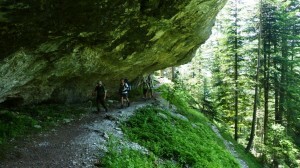 Price includes two nights half board in Refuge Wallon, three picnic lunches, three days guided trekking. Min 4P.